Suzanne is a gorgous, white girl with red spots that raced at 61lbs. Her sire is the famous Kiowa Mon Manny and her dam is Gable Ton. She just turned 5 on May 6th. Suzanne raced 168 races at Tri State in WV and Orange Park in Florida. She was a good racer, racing mostly at A level. She is a friendly girl with ears that sometimes stand straight up when she is excited. She seems pretty confident and curious and is very friendly and sweet. She did not pass her cat test at the track so needs a home with no kitties. She is fine with small dogs and is living in a foster home with a couple of them. She is a happy, friendly, well behaved girl that her foster dad described as "a sweet old soul". She does complain a bit about being left alone in a crate so probably wouldn't do well as an apartment dog. She is very smart and figured out the doggy door in her foster home right away. She gets along great with other male and female dogs in her foster home so would be a good choice for a family with several other dogs. 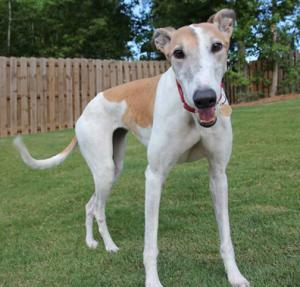 She would be an easy addition for a first time greyhound owner and has been in a foster home for a little while so is already home acclimated. This is a great gilr and so pretty!! !